poor planning and experimental techniques resulted in animal studies of limited value, and consequently in more testing than should have been needed. With the introduction of Good Laboratory Practice and of Organisation for Economic Co-operation and Development (OECD) test guidelines (TGs) and animal welfare policies, the quality of animal data has become much less of a problem, and refinement has considerably improved. The improvement of cell culture, tissue culture and molecular biology technology kindled the hope for replacement. Meanwhile, standalone in vitro methods (e.g. for skin and eye irritation) or batteries of tests (e.g. for skin sensitisation) can address local toxicity. Likewise, methods to address specific early effects or mechanisms, such as genotoxicity or oestrogenic activity, are available. A major challenge today is the prediction of complex toxicological effects such as systemic and developmental toxicity. Large research programmes, e.g. ToxCast or SEURAT, aim to meet this challenge.3,4 Any new approach to complex toxicological effects combines various methods (in silico, in vitro and in vivo) in a testing battery or strategy.5,6 These approaches use mechanistic information, and are constructed according to (putative) adverse-outcome pathways (AOPs).7 Such information is, of course, also useful in supporting the read-across of apical toxic effects of different chemicals. Read-across can actually become a successful part of many integrated approaches for testing and assessment (IATAs). Traditionally, chemicals are considered candidates for read-across, if they share structural similarity or are metabolically or spontaneously transformed to common products. It is assumed that structural similarity will result in a common mode-of-action. When assessing wanted pharmacological activities or unwanted toxicological hazards in research and development, applying read-across is already possible when the substance in question still only exists on paper. High-quality predictions are valuable for success in product development. At some point, the predicted effects are determined experimentally for promising candidates, and it is at this point that the consequences of poor read-across hit back. Again, identifying the correct similarity between read-across source and target chemicals is crucial. The ‘ugly duckling’ characteristics of read-across (Figure 1) originate from areas in which it is used as a quick (and cheap) means to generate hazard information, either to fulfil regulatory data requirements, or to identify and list substances allegedly of very high concern (no reference given here, since this PiLAS is not a pillory). It also may originate from the idea that any information is better than no information in situations where there is no budget, or when animal testing is simply out of the question. Global efforts to identify and substitute hazardous chemicals can only succeed, if so-called ‘regrettable substitutions’ can be avoided. Neither overestimation nor underestimation of hazards by read-across is helpful in this context. Actually, it takes a wide range of thorough considerations to perform a robust and meaningful read-across — and these need to be documented. 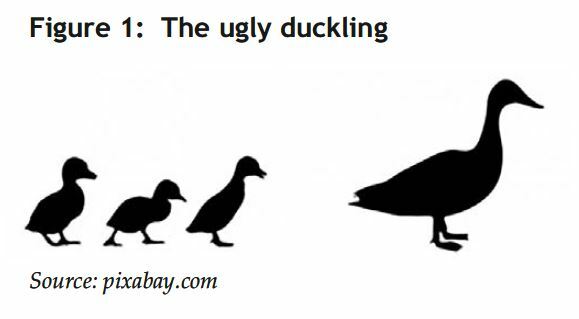 To toxicologists with long experience in their respective chemical space, similarity may seem so obvious that their read-across justifications are rather frustrating to comprehend. Considering the huge number of chemicals that were to be registered within the short period of eight years, the REACH legislation introduced a previously mostly-unknown component to chemical legislation. It was proposed that acceptance of registration, if appropriate, would be granted after automated dossier screening. Any scientific review of toxicological data would then be performed at a later stage, and this review would have to be conducted for at least 5% of the registered substances. With this procedure, the opportunity for an upfront discussion on the data requirements and suitability to support a read-across approach is in no way considered. This registration strategy has the advantage of speed and a certainty of meeting submission deadlines, but he disadvantage of uncertainty with regard to follow-up activities, the latter arising from the possibility that the read-across assessment might be judged to be deficient and the decision would then be made that the target substance must be tested. Both challenges and improvements to read-across approaches have been triggered by cases where apparently small changes in structures resulted in vast changes of the hazard properties (so called ‘activity cliffs’). The most prominent examples originate from differences in the interactions of substances with enzymes and receptors. The substances 2-acetylamino fluorene (2-AAF) and 4-acetylaminofluorene (4-AAF) are structurally very similar. As well as being a bladder carcinogen, 2-AAF is a strong liver enzyme inducer, leading in long-term studies to liver tumours. However, 4-AAF only slightly induces liver enzymes and does not induce the formation of liver tumours.12 Enantiomers of 1-hydroxyethylpyrene are activated to mutagenic sulphates by different sulphotransferases, 13 and the enantiomers of Carvone smell of caraway or spearmint,14 to name but two examples. When looking at the two-dimensional description of a chemical only (e.g. SMARTS pattern or Tanimoto score), stereoisomers appear identical, but three-dimensional structure modelling for receptorbinding simulation can differentiate stereoisomers. Regardless, stereo-isomeric and regio-isomeric differences of molecules appear to be small alterations, as compared to the changes usually bridged by readacross (e.g. homologous series). It is important to know which aspect of similarity between two chemicals is governing their similar hazardous properties. Evidently, properties and effects closer to the apical toxic effects are more predictive and less uncertain. Lately, the concept of applying ‘functionality’ rather than (or in addition to) material descriptors was proposed for nanomaterials.18–20 This can be taken a step further: Rather than using the molecular structure or the ‘functionality’, read-across can be based on the early biological effects or common modes-of-actions of two (or more) substances. Actually, such a concept is typically represented by the common classification of any chemical with a pH of > 11 as corrosive, but no one would consider calling it functionality-based or mode-of-action-based read-across. The concept of biologically-based activity relationship (QBAR, i.e. referring to QSAR, the structure-based activity relationship) has been discussed and exemplified by van Ravenzwaay et al.12 The example of different toxicities of the structurally-similar isomers, 2-AAF and 4-AAF, was given above. These differences are reflected in different metabolome-patterns induced by these two compounds. Another example are fibrates with structural similarity. Most of these fibrates also show toxicological and pharmacological similarity, based on the metabolome data. Gemfibrozil, however, does have different pharmacological and toxicological effects. The differences in the target organ (e.g. the kidney) for Gemfibrozil and its pharmacological effect (cholesterol lowering) can be identified, based on the metabolome data. This example shows that structurally similar chemicals need not necessarily have the same apical effects, and in this case biological data are needed to prove toxicological similarity. The call for good science and documentation in hazard assessment, that was made by Russell and Burch,2 is as relevant now as it was in 1959. Indeed, guidance documents and reporting templates have undergone several refinements,21–23 strategies have been published,11,24,25 and recently, the ECHA has published the Read-Across Assessment Framework (RAAF).1 The latter aims at the quality control and transparency of read-across evaluations. It provides structure, and ensures that all relevant elements are addressed and will lead to a conclusion on whether or not a read-across is scientifically acceptable. Read-across approaches rely on existing experimental data on potential read-across source substances. Both the generation of new data and their dissemination via the ECHA website continue to provide opportunities for read-across. Most importantly, IT tools facilitate the identification of analogues and the easy display of existing data. The most sophisticated tool in this regard is the OECD QSAR toolbox,26 but already, simpler search tools such as eChemPortal27 permit a quick search for potential read-across candidates. Read-across has found its way in other modern chemical legislation, such as the new chemical legislations in Korea (K-REACH) and China. It helps in the hazard assessment of new cosmetic products that are banned from animal testing in the EU. Read-across case studies are discussed at the OECD level,28 illustrating the current worldwide interest in this approach. One of the many important points made by Russell and Burch in their 1959 book,2 is the inappropriateness of blindly taking mammalian studies as the ‘gold standard’ for human health hazard assessment. It needs to be remembered that this can also be applied to the read-across approach, since most of the experimental data on the similar chemicals are animal data. Read-across assessments predicting the outcome of animal studies may be perfect with regard to fulfilling regulatory requirements, but the ultimate aim remains human health hazard assessment. Developing sound and well-justified read-across and grouping will be neither quick nor easy (hence it should not be termed ‘non-testing’), and it will often require fortification by ‘mode-of-action-tailored’ experimental data, in order to cover chemicals with similar early interactions, but at first glance not necessarily closely-related structures. Newly generated ‘omics’ and in vitro data addressing early (biological) effects, as well as already-existing REACH dossiers,29 SEURAT30 and Toxcast31 data, offer tools to improve read-across, based on properties closer to the hazard (the apical effect) beyond the traditional concept based only on QSARs. Established AOPs and the identification of molecular initiating events (MIEs) facilitate this use of read-across (and were, on the other hand, often identified from a set of experimental data from structurally-related chemicals). The combination of different experimental data and their relation to apical toxic effects may indeed offer the most powerful tools to advance the Three Rs. Considerations of relevant data in creating a read-across case are also used to build IATAs. Both require a sound scientific case, relevant data to support them, and awareness (and acceptance) of their limitations. 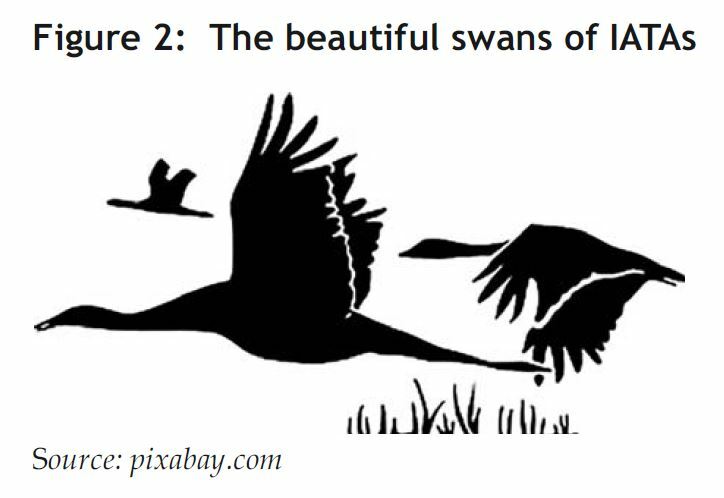 a beautiful swan (Figure 2). 2 Russell, W.M.S. & Burch, R.L. (1959). The Principles of Humane Experimental Technique, 238pp. London, UK: Methuen. Available online: http://altweb.jhsph. using read-across: Assessing the use of novel testing methods to strengthen the evidence base for decision making. Environmental Health Perspectives, E-pub ahead of print [doi: 10.1289/ ehp.1409342]. C., Halder, M., Janusch Roi, A., Kienzler, A., Madia, F., Munn, S., Nepelska, M., Paini, A., Price, A., Prieto, P., Rolaki, A., Schäffer, M., Triebe, J., Whelan, M., Wittwehr, C. & Zuang, V. (2014). Alternative Methods for Regulatory Toxicology — A State-of-the-art review. Report EUR 26797 EN, 461pp. Ispra, Italy: European Commission, Joint Research Centre, Institute for Health and Consumer Protection. Available at: http://echa. C., Hoffmann, S., Hubesch, B., Jacobs, M.N., Jaworska, J., Kleensang, A., Kleinstreuer, N., Lalko, J., Landsiedel, R., Lebreux, F., Luechtefeld, T., Locatelli, M., Mehling, A., Natsch, A., Pitchford, J.W., Prater, D., Prieto, P., Schepky, A., Schüürmann, G., Smirnova, L., Toole, C., van Vliet, E., Weisensee, D. & Hartung, T. (2015). Integrated Testing Strategies (ITS) for safety assessment. ALTEX 32, 25–40. Landesmann, B., Martos, S., Matevia, M., Toole, C., Rowan, A., Schultz, T., Seed, J., Senior, J., Shah, I., Subramanian, K., Vinken, M. & Watkins, P. (2013). Building shared experience to advance practical application of pathway-based toxicology: Liver toxicity mode-of-action. ALTEX 31, 500–519. amending Directive 1999/45/EC and repealing Council Regulation (EEC) No 793/93 and Commission Regulation (EC) No 1488/94 as well as Council Directive 76/769/EEC and Commission Directives 91/155/EEC, 93/67/EEC, 93/105/EC and 2000/21/EC. Official Journal of the European Union L136, 29.05.2007, 3–280. 14-A-07-EN], 131pp. Helsinki, Finland: European Chemicals Agency. Available at: http://echa.europa. eu/documents/10162/13639/alternatives_test_ animals_2014_en.pdf (Accessed 11.11.15). 10 Ball, N., Bartels, M., Budinsky, R., Klapacz, J., Hays, S., Kirman, C. & Patlewicz, G. (2014). The challenge of using read-across within the EU REACH regulatory framework; how much uncertainty is too much? Dipropylene glycol methyl ether acetate, an exemplary case study. Regulatory Toxicolology & Pharmacology 68, 212–221. 12 van Ravenzwaay, B., Herold, M., Kamp, H., Kapp, M.D., Fabian, E., Looser, R., Krennrich, G., Mellert, W., Prokoudine, A., Strauss, V., Walk, T. & Wiemer, J. (2012). Metabolomics: A tool for early detection of toxicological effects and an opportunity for biology based grouping of chemicals — from QSAR to QBAR. 14 Brenna, E., Fuganti, C. & Serra, S. (2003). Enantio-selective perception of chiral odorants. Tetrahedron: Asymmetry 14, 1–42. of skin sensitisation potential. Journal of Applied Toxicology 28, 443–454. How well do in silico models currently predict the sensitization potential of a substance. Regulatory Toxicology & Pharmacology 67, 468–485. using non-animal test methods. Regulatory Toxicology & Pharmacology 71, 337–351. 18 Hendren, C.O., Lowry, G.V., Unrine, J.M., & Wiesner, M.R. (2015). A functional assay-based strategy for nanomaterial risk forecasting. Science of the Total Environment 536, 1029–1037. (DF4nanoGrouping). Regulatory Toxicology & Pharmacology 71, Suppl. 2, S1–S27. NanoSafety Cluster Working Group 10. Nanotoxicology 8, 334–348. 23 ECHA (2013). Grouping of Substances and Read-across Approach — An illustrative example [ECHA-13-R-02-EN], 11pp. Helsinki, Finland: European Chemicals Agency. 24 Patlewicz, G., Ball, N., Becker, R.A., Booth, E.D., Cronin, M.T., Kroese, D., Steup, D., van Ravenzwaay, B. & Hartung, T. (2014). Food for Thought: Read-across approaches — misconceptions, promises and challenges ahead. ALTEX 31, 387–396. Toxicology & Pharmacology 72, 117–133. for Economic Co-operation & Development. 29 ECHA (undated). Registered substances. Helsinki, Finland: European Chemicals Agency. Available at: http://echa. europa.eu/information-on-chemicals/registeredsubstances (Accessed 12.11.15). 30 SEURAT (undated). Welcome to the SEURAT-1 website. Available at: http://www.seurat-1.eu/ (Accessed 11.11.15).